- Water is a polar solvent. This is because water is a polar molecule meaning it has different charges at each end of the molecule meaning it can pull apart and surround other molecules “dissolving them”. This includes the ability to dissolve many ionic and covalent bonds however other covalently bonded solvents such as ethanol do not dissolve compounds so easily. Most reactions within cells occur in water (aq). - Water is an excellent transport medium because so many different substances will dissolve in it. - 4 degrees is the maximum density this is because beneath 4 degrees the water molecules begin to spread out into a hexagonal formation to form ice which is less dense then the liquid it came from. Above four degrees the molecules also spread out as they gain energy so therefore decrease in density. This property allows fish to survive in cold waters as the whole lake doesn’t freeze over, just the surface. - Water has a large heat latency (slow to release and absorb heat). This is because the delta negative oxygen attracts delta positive hydrogen from other molecules which requires extra energy to heat up / cool down. As there are extra forces to break. This is why the sea stays a relatively constant temperature throughout the year. Facilitates life. 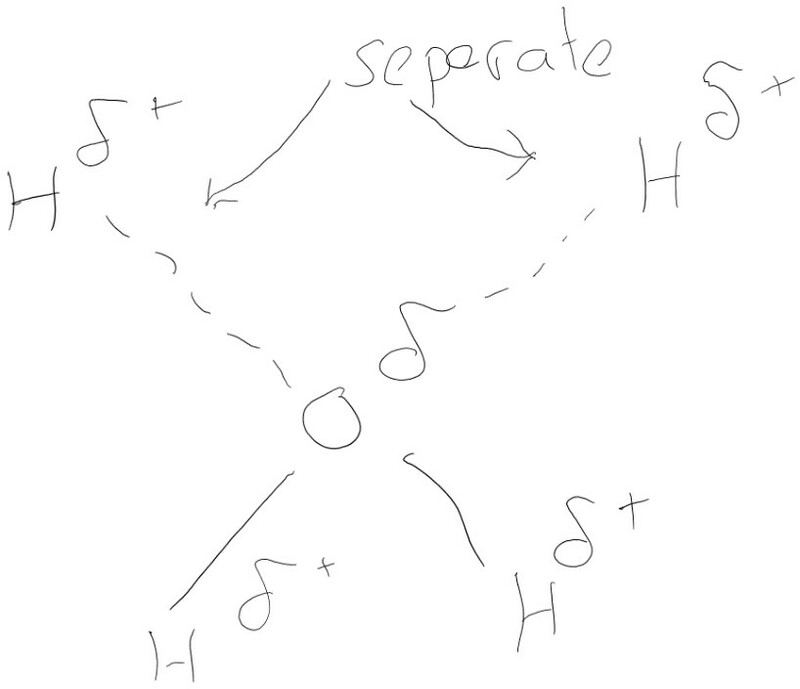 - Water molecules are cohesive, the fact that it is a dipole means that other other water molecules are slightly attracted to other water (see diagram). This is extremely important for the movement of water from the roots to the leaves of plants. - Water cannot be compressed, this makes it good as a liquid in hydraulic mechanisms within organisms. - Water has a very high surface tension because the attraction between the water molecules (specifically the hydrogen bonds) is greater than the attraction between the water molecules and the air. Critical for plant transport systems and life at the surface of bodies of water.